GMC's 2020 Sierra 2500HD AT4. SAN DIEGO — GMC is expanding its new AT4 subbrand and many defining characteristics of the Sierra 1500 to its heavy-duty brethren. Like the light-duty model, the 2020 GMC Sierra 2500HD and 3500HD will feature the brand's six-way MultiPro tailgate, large head-up display and advanced trailering system with an app, among other things. Compared with the current Sierra HD, the redesigned pickup is taller and longer but features a 2.5-centimetre (one-inch) lower bed lift-in height. It incorporates design elements similar to its light-duty sibling, including redesigned C-shaped headlamps and taillamps and a larger grille — unique to each trim — and functional hood scoop. "It's bigger, stronger and smarter," Duncan Aldred, vice president of GMC, said during the vehicle's Tuesday unveiling. He called the Sierra HD "the crown jewel" of the brand’s lineup. The pickup, expected to go on sale late summer, will be available in base, SLE, SLT, AT4 and Denali in dual-rear-wheel and single-rear-wheel configurations. Like its Silverado HD sibling, the Sierra HD will be powered by an all-new gasoline engine or Duramax 6.6-litre diesel engine with SAE-certified 445 hp and 910 pound-feet of torque. The performance of the diesel engine, mated to an Allison-branded 10-speed transmission, is similar in horsepower to similar Ford and Ram models, but with lower torque output. Ford's 6.7-litre Power Stroke V-8 diesel is rated at 450 hp and 935 pound-feet of torque, while the Ram HD's Cummins 6.7-liter diesel engine features 400 hp and 1,000 pound-feet of torque. Towing capacity, according to GMC, will exceed 13,607 kilograms (30,000 pounds). GM did not release pricing or payload for the pickup. 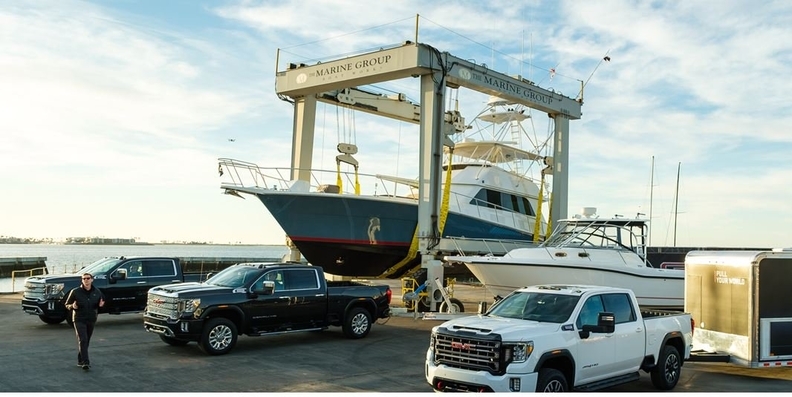 Aldred called the pickups “the ultimate trailering machines,” following a Sierra HD 3500 model pulling a large boat and marine lift behind it during the unveiling. The boat and hoist weighed more than 102,058 kilograms (225,000 pounds). GM said it will release specific towing, payload and other specifications closer to launch. The Sierra HD AT4 model, like its light-duty siblings, features darker or blacked-out parts as well as additional off-road components such as off-road suspension, Rancho shocks, skid plates and an Eaton locking rear differential. 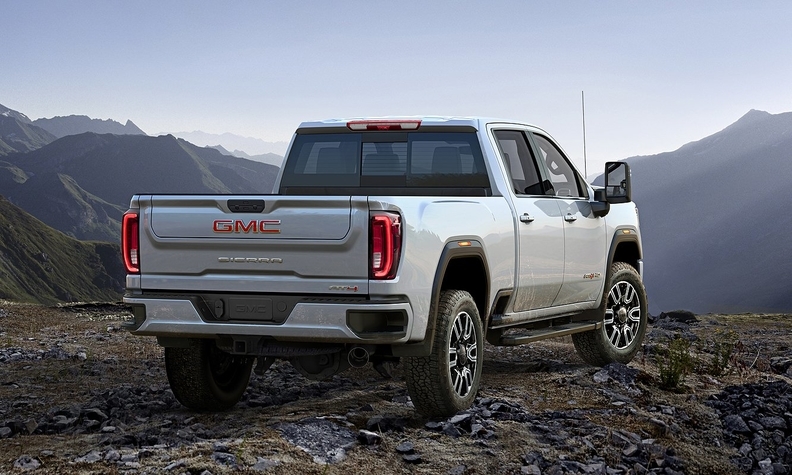 GMC launched the AT4 subbrand last year on the 2019 Sierra 1500. 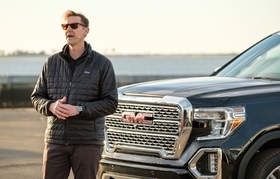 GM invested US$1.5 billion to support the launch of the redesigned Sierra HD and Silverado HD at Flint Assembly in Flint, Mich.
"It's bigger, stronger and smarter," Duncan Aldred, vice president of GMC, said of the 2020 GMC Sierra Heavy Duty at a event in Chula Vista, Calif., on Tuesday. He called the Sierra HD "the crown jewel" of the brand’s lineup. Cargo bed side steps on all box styles, located in front of the rear wheel openings, ahead of corner steps in the rear bumper to improve access to the cargo area. ProGrade Trailering System that includes an in-vehicle Trailering App that allows trailer diagnostics and pre-maintenance reminders, among other things. Best-in-class front head and legroom, with crew cab models. An available camera system with 15 views, including a "transparent trailer view," which helps optimize the driver's view around the truck and compatible trailers. Available 15-inch-diagonal head-up display that offers useful trailering information, including vehicle speed, navigation information and an inclinometer display for the road grade.